Whatever your dog’s breed, they need a safe space to lay their head. You’re probably familiar with all the usual dog sleeping spots – kennels, crates, cushions, or even your bed – but a new sleeping arrangement is now jumping onto the scene. This is the dog teepee; a conical tent designed specially for canine napping. The main advantage of a teepee bed is the security and privacy it provides – with a fabric roof over their heads, dogs will feel as if they’re in a cozy den, mirroring the way they would sleep in the wild. Pet teepees are a lot more attractive to look at than many conventional pet beds, offering a fun and quirky look, available in all kinds of patterns and styles. If you think this type of dog bed could be perfect for your pooch, you’ve come to the right place. We’ve searched the petcare market for the best teepees on offer right now, and compiled a list of our top 10 to help you choose. We’ve also taken the time to answer some common questions about these beds, and their uses. Kicking off today’s list is Zaihe, with their versatile and cozy teepee tent for dogs. Made from sturdy and natural cotton canvas, the bed provides pooches with a secure covered space. With its tasteful cream color, the teepee will blend nicely with almost any interior, while the machine washable fabric makes cleaning a breeze. Inside the teepee, a plush cushion gives your canine companion a soft place to sleep. Available in three different sizes, it’s suitable for virtually any dog. The teepee also features a set of curtains, which can be easily buttoned back allowing dogs to have their own space, or peek out. Owners are impressed with the generous space on offer, and love the way this cute teepee looks. The next teepee dog bed to earn itself a spot on our list is this offering from Little Dove. Featuring durable cotton canvas and sturdy pine poles, this pet bed is made to last – even when it’s under assault from more energetic pets! It’s simple to assemble too, so you can rest assured your pooch will be relaxing in style in no time. The simple white cloth fits in with any interior, and you can simply throw it in the washing machine when it becomes dirty. Little Dove place a lot of faith in their products, offering customers a money back guarantee with every product sold. Owners say the teepee provides pets with a cozy corner all of their own, which they love. It even includes a hanging chalkboard and chalk, so you can personalise your canine companion’s space even more. Do bear in mind that this teepee does not come with a built-in pillow, and you’ll need to supply one. UKadou have also impressed us, with this high quality but budget friendly dog teepee bed. The cozy nook it provides is ideal for pooches weighing under 15 pounds, such as Yorkies, Daschunds, and Pomeranians. It’s made from premium materials for great durability: the 100% cotton canvas is breathable, soft, and sturdy, while its natural pine poles are strong and lightweight. The tend is designed to for simple assembly and collapse, making it easy to fold away for storage. The teepee also includes a set of curtains, providing your pet with further privacy. Customers report that the bed is excellent quality for its price point, but advise placing a dog pillow inside to weigh down the lightweight design. 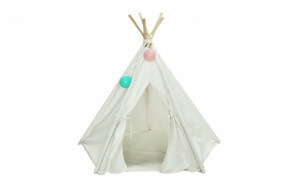 Little Dove have earned themselves a second spot on our list with this cute and colorful teepee. 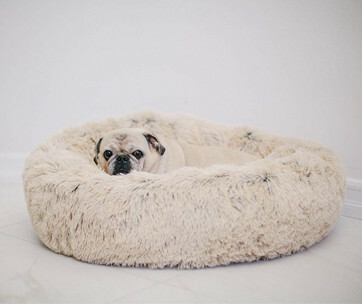 If you’re not a fan of plain white furniture, and prefer to inject a splash of color into your home, then this pet bed could be the perfect option for you. Like all Little Dove products, the teepee is made from high quality materials: the 100% cotton canvas is soft, durable, and machine washable, while natural pine poles provide excellent stability. The teepee is easy to assemble, giving your dog their very own space in no time. It’s easy to collapse, too, giving you more room when the need arises. Like many Little Dove products, this bed comes with its own chalkboard and chalk – you can write your own message to let others know that this space belongs to your pet. A matching cushion that sits in the bottom of the teepee completes the look – your pet can chill out in comfort and style! This chic Indian-style teepee represents Little Dove’s third and final entry on our list. The stylish dog tent is soft gray in color, decorated with a fringe of cute pom poms in muted tones. If your tastes are a little brighter, Little Dove have you covered, too – the tent is also available in yellow and white stripes. 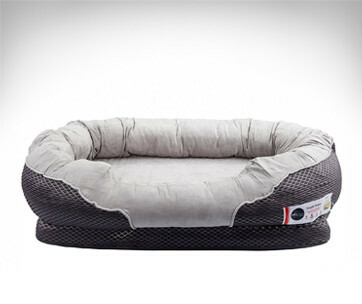 Both options are made from 100% cotton canvas, and feature a padded mat to keep dogs comfortable as they relax. Both parts can be cleaned in the washing machine, for your convenience. The canvas is supported by durable pine poles, and it built to last. Little Dove’s teepee is great quality for its price, and is backed by a money-back guarantee. Owners say it offers a cozy yet spacious nook that pets love. With its fun maritime design, VILER’s teepee is the next to make it on our list. It features high quality cotton and pine, meaning it will last for many years to come. A cute striped pattern, topped an anchor motif make it a stylish and playful option for all the beach dwellers out there. The teepee also comes with its own cushion, positioned at the base, allowing dogs to rest comfortably. The lightweight design is easy to assemble and collapse for easy transportation and storage, while the surprisingly spacious interior provides pets with a secure and comfortable spot to relax. 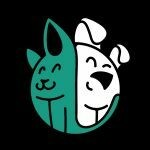 Cats and dogs alike will love spending time in this stylish, cozy hideaway. 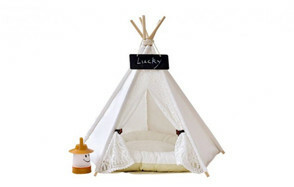 The next bed to earn a spot on our list is this pet teepee by DEWEL. Its lace-fronted design is delicate yet durable, featuring 100% cotton canvas, and natural pine support poles. To help keep muddy paw prints at bay, the cover is machine washable, and easy to detach by simply sliding out the poles. The teepee is available in three different sizes, making it a perfect fit for pooches great and small. It also features retractable curtains, to give your canine companion extra privacy. Pooches and owners alike love the cute design that blends well with almost any interior. Bear in mind that a pillow is not included with this teepee, so you’ll need to track one down separately. Making their second appearance on our list is Zahie, with their adorable star-spangled pet teepee. The tent provides an ideal spot for pets to relax, and comes with its own chalkboard, chalk, and a matching cushion base. This double sided cushion features the same black and white star pattern as the rest of the teepee, completing the look. Pets will love snuggling up beneath the soft, cotton tent covering. This machine washable covering can be removed with ease, for convenient cleaning. It’s easy to assemble and lightweight, available in three handy sizes. At the teepee’s entrance, a pair of curtains gives your pooch some extra privacy – a perfect spot for hiding their toys and treats! The next dog teepee bed to earn a spot on our list is Youngs’. Its fun design features black and white zigzags, with a splash of turquoise at its peak. 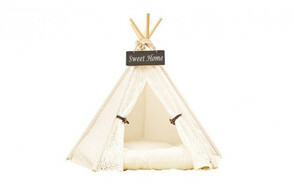 Available in two different sizes, and made from 100% cotton canvas, this cozy teepee is the perfect space for pets off all sizes to relax after a tiring day of fun. Its breathable fabric allows air to circulate without compromising on privacy, while natural pine support rods keep the tent stable. All Youngs’ materials are high quality and designed to last, so your pet can enjoy their new bed for many years to come. The teepee includes a matching pillow, for extra comfort, as well as a chalkboard and chalk for additional personalisation. At its entrance, a pair of curtains give the tent an extra layer of privacy. Last but not least is this dog tent bed by Tanen Tech. The teepee-style bed is made from high quality canvas fabric and pine supports, and for under $30 it’s excellent value for money. The five walled design provides pets with the perfect cozy space to curl up and relax. It’s easy to assemble too, making for convenient storage and travel. Once disassembled, the cover is simple to clean – just pop it in the washing machine on a low temperature. A pair of curtains at the teepee’s entrance give pets an extra level of privacy, too. Customers say that pooches love the cozy space, while the chic white fabric blends in well with almost any interior. These 10 beds are the best dog teepees about, and we’re confident you’ll find something to meet your dog’s need no matter their size and your style. To help you pick, and to get the most out of these beds, we’ve put together this handy buying guide. The first thing to bear in mind when purchasing a teepee bed for your dog is size. You should measure your dog from the tip of their nose to the end of their tail, and from their feet to the tops of their ears. Use these measurements as a guideline when choosing your pet’s bed. Some manufacturers will provide guidance about which of their sizes are suitable for various breeds. Another thing to consider when choosing your dog’s new teepee is the budget you’re working with. Fortunately, our list includes options suitable for every budget. You can come by a quality teepee for as little as $25, but pricier options often include extra features. Whichever dog bed you choose, chances are it will be a prominent feature in your home. For this reason, it’s important to choose one you find appealing. 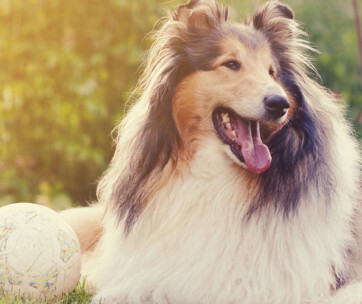 Luckily, petcare companies have you covered - whether you’re looking for something simple, or fun patterns and bright colors, we’re confident you’ll be able to find something on our list that suits your preferences. Last but not least, it’s a good idea to consider which extra features you want when choosing a teepee for your dog. Many designs come with a specially shaped pillow, helping pets stay comfortable when they curl up inside. Another popular extra is a hanging chalkboard, which you can use to personalise the bed with your dog’s name. It’s also a good idea to look out for teepees that collapse easily, so you can transport and store them without hassle. Another great reason to invest in a teepee bed for your dog is their excellent versatility. As well as providing a cozy spot for your pooch at home, they can be put to a few other uses. Cat owners can make use of these handy pet beds, too. Cats, like dogs, enjoy relaxing in cozy spaces - jus think of the almost universal feline penchant for cardboard boxes! Teepees without pillows in their base can also be used to cover litter boxes, giving cats some privacy while they go about their business. In sunny weather, you can take your pet teepee outdoors to provide your pooch with some much-needed shade. The canvas cover makes an excellent doggie parasol, protecting them from the sun and reducing the risk of heat stroke and dehydration. Teepees also make great hiding spots for your pet when they need to get away from it all. Shy or anxious pets can become stressed by changes about the house and unfamiliar guests, so having a secure place to call their own really helps with relaxation. The hiding spot which teepees provide can also be used by your pet to stow their treats and toys away. Q: What is a dog teepee bed? A: Dog teepees are a type of pet bed. Their design is based on the conical tents originally used by native American tribes. The beds consist of a series of poles, tilted so their ends meet at a peak, engulfed by a canvas over. Of course, dog teepees are far smaller than their human counterparts, and can comfortably fit in the corner of your living room. They’re an ideal spot for smaller dogs, such as Chihuahuas and Yorkies, to relax and sleep. Many dog teepees include a specially shaped pillow in their base, to keep pooches comfortable during use. Q: Is a dog teepee bed waterproof? A: Unfortunately, the dog teepee beds on this list are not waterproof. Their covers are made from cotton canvas, which is lightweight, durable, soft, and breathable. This last characteristic makes the beds cool and comfortable, but also means that water can penetrate the fabric. Q: How should I clean my dog teepee bed? A: Any dog bed should be cleaned at least once a week. This ensures that excess hair, dander, and dirt are removed from your dog’s sleeping space, leaving it more comfortable and hygienic. Most dog teepees are fairly straightforward to clean. Their cotton covers are usually machine washable, so you can simply remove them, and wash at a low temperature. We recommend using a sensitive detergent, to reduce your dog’s risk of experiencing skin irritation. During molting season, or after a particularly muddy walk, you may need to wash your dog’s bed more than once a week. Every dog is different, but you’ll soon fall into a routine that works for you both. Q: My dog loves to chew, will teepee bed hold up? A: Chewing is a natural behavior for dogs - like toddlers, they largely explore the world through their mouths. Q: Can I use teepee bed outdoors? A: Teepee beds can indeed be used outdoors, but only in certain circumstances. As we mentioned earlier, they’re not usually waterproof, so can’t replace a traditional outdoor kennel. However, on dry days, it’s completely fine to take your dog’s teepee out into your yard or garden, to provide them with a shady and comfortable place to lie. For us, the best dog teepee bed has to be Zaihe’s sturdy but stylish offering. Made from 100% cotton canvas and natural pine supports, it’s lightweight, breathable, and durable. The lace detailing adds a touch of class to your pooch’s cozy space, which can be had in three different sizes, so you’re sure to find the right fit whether you’re shopping for a Yorkie or a Labrador. Each teepee comes with its own cushioned base, which fits perfectly inside the tent and gives dogs a soft and comfortable surface on which to rest their tired paws. The easy-to-assemble design can be quickly collapsed for superior storage and transportation, too, while the chalkboard and chalk included with every purchase makes it easy to personalise your pet’s bed to suit their unique character, Overall, this pet teepee is a sound and stylish investment for both you and your canine companion.